If you can tell your sperm whale from your humpback, you’ll likely know that a “Nantucket sleigh ride” is whaling slang for what happens when a harpooned whale speeds off towing a longboat with half a dozen sailors across the ocean. While John Guare’s new play takes this 19th century phrase as its title, it has nothing to do with whaling and the only sea creatures it features are a lobster and the shark from Jaws. But the lively, madcap and, at times, whimsical tale is like an oceanic roller coaster: its characters both dead and alive lurch between past and present, fantasy and reality, and a play-within-a-play. 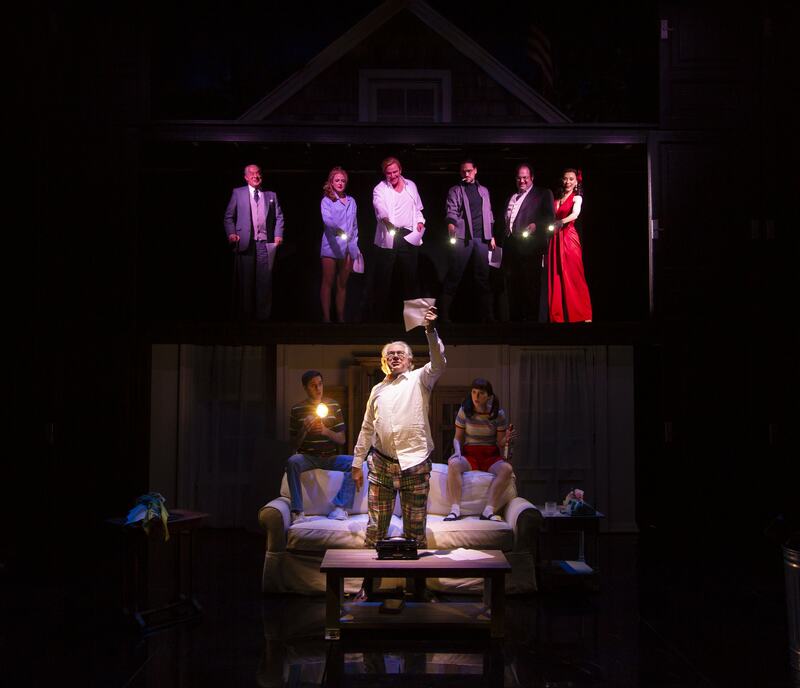 With Nantucket Sleigh Ride, John Guare is reunited with his frequent collaborator, director Jerry Zaks. The central character is also a playwright, but, in this case, a one-hit wonder. Edmund “Mundie” Gowery, played by a charmingly blustery John Larroquette, has suffered a decades-long case of writer’s block and has abandoned the profession. When we meet him, he is a successful Wall Street titan, who explains his job like this: “I persuade people to sell things they love, for things they don’t want.” He habitually denies that he is the same Edmund Gowery who once wrote a famous play, but his literary reputation comes back to haunt him when two troubled twentysomething siblings, Lilac and Poe, walk into his office in search of the key to their past. And so the sleigh ride begins. At the heart of David Gallo’s superb set, a wall of doors four storeys high open and close to reveal new locations or new characters. Much of the action unfolds via telephone calls and Mundie’s lawyer and two lovers appear above and behind him to take his calls. One phone call turns back the clock to 1975, the summer of Jaws, when Mundie’s lawyer, an appropriately oily Jordan Gelber, persuades him to invest in a property on Nantucket. It turns out that Mundie is already well-known on Nantucket. Most of the town’s residents took part in an amateur production of his play, leading to some fun repetitive gags involving, among others, a policewoman, a Vietnam veteran, and the daughter of a renowned children’s author. The supporting cast including Clea Alsip, Tina Benko, Jordan Gelber, Stacey Sargeant and Will Swenson all double ably through a dizzying array of characters. Lilac and Poe, portrayed as creepy child versions of themselves by Adam Chanler-Berat and Grace Rex, are thrust into Mundie’s inexperienced care. The kids are cartoon-like in their need to be fed and nurtured – a thread that spools out to encompass a sub-plot about Disney, with Walt himself making an appearance. Mundie’s bizarre adventures in Nantucket make a side-swipe at the commercialization of culture. Disney promises to make you “forget your memories and replace them with my memories.” It’s an apt comment for a play that delves into how we remember and how memories can be crucial to creative impetus. Mundie’s literary idol, poet Jorge Luis Borges, despite being dead, pops in and out of the play. Portrayed by a twinkling Germán Jaramillo, Borges serves as a playful punctuation of Mundie’s struggles, offering apposite bon mots. As you can tell, the plot is convoluted with as many near disasters and sudden twists as a real Nantucket sleigh ride. There’s almost too much to process in Mundie’s feverish trip down memory lane that, through plenty of absurd tangents, ultimately leads to both therapy and inspiration. The last scenes, however, descend into a feebler and flatter conclusion than the rip-roaring romp with a surfeit of funny characters, stellar performances, and witty turns of phrase that came before them. The result is a ride that ends less spectacularly than the previous raucousness has led the audience to expect.